1. To make molo balls, mix ground pork, garlic, green onions, shrimps, and eggs. Season with salt, pepper, and vetsin. 2. 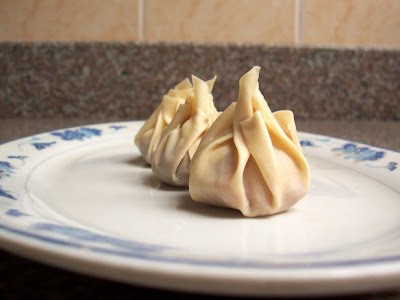 Place a teaspoonful of the mixture on the center of a molo wrapper. Fold wrapper diagonally. Roll the base of the triangle once towards the top. Pull the two ends together towards the center and fasten with a little water. 3. To make the molo broth, heat oil in a casserole. Saute garlic and onions. Add the shrimp and chicken meat and cook for 10 minutes. Add chicken stock. Season with salt and pepper. Bring to a boil. 4. Drop the molo balls and cook for another 15 minutes. Add the chives and remove from heat. Serve hot.